Around here, we don’t just have birthDAYs. We celebrate for several days. This is Jack’s birthweek, and today another homeschool mom conveniently scheduled a field trip to pizza parlor. So we got to hang out with friends, make new friends, eat great pizza, and watch the staff “throw” pizza dough. Tomorrow is the zoo, and I’ll try to actually have pictures of animals and stuff. Here’s a picture of my “little” boy, though. 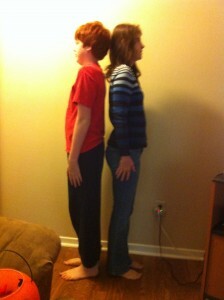 I always knew he’d be as tall as me when he turned twelve. And…yep.